Mo Lotman is a freelance writer and publisher of The Technoskeptic, a magazine advocating a more holistic and conscientious relationship with technology. It includes original reporting, reviews, commentary, and a podcast. He also speaks publicly on the topic of technology and society. 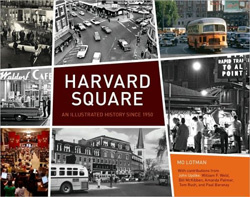 Mo is also the author of Harvard Square: An Illustrated History Since 1950, published by Stewart, Tabori & Chang, an imprint of Abrams. The book is a street-by-street, pop-culture time capsule of the famous neighborhood in Cambridge, Massachusetts, where world leaders, intellectuals, punks, and panhandlers have rubbed elbows over generations. It features over 500 vintage and contemporary photographs and short chapter introductions by famous denizens including John Updike, who called the book “a priceless assemblage.” It was a top-ten local hardcover nonfiction bestseller after release and the #1 Massachusetts travel book on Amazon for several months. 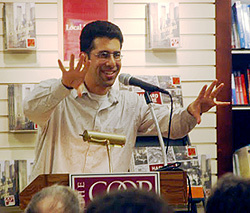 Subsequently, he wrote and voiced a related radio piece for NPR’s All Things Considered. In addition, Mo has recently written a middle-grade novel, Clotilda Verger and the Secret of Samuel Soule, for which he is currently seeking representation. A twelve-year-old girl of divorced parents sneaks away to a famous cultural institution where she stumbles upon a historical puzzle with implications beyond herself. In the tradition of From the Mixed-Up Files of Mrs. Basil E. Frankweiler or Night at the Museum, this is a fun throwback story to engage readers’ love of learning, with a message of both self-reliance and the value of finding community. Warning: contains no vampires, werewolves, or magicians. Other experience includes years of promotional writing for various cultural organizations, including the monthly slide-show-talk event Nerd Nite, which he hosted for two years. He has also recently edited a pair of business books Who’s With Us? and Now: Do+Make by personal and career coach Angela Lussier.